Bhutan is called the “LAND OF PEACEFUL DRAGON” in Bhutanese language and is still regarded as one of the last “ SHANGRI – LA”. Bhutan is unique country by character & by nature of the hills and people from other parts of the Himalayas. This “Kingdom Of Himalayas” is a tiny country and only 20% of the country is permissible to visit by foreigners including Indians… Bhutan with an area of 38,400 Sq. Km lies lies along the lofty ridges of Southeast Himalayas, bordered on the north and east by Tibet and on the south and west by India respectively. The landscape consists of high and rugged mountains towering peaks reach a height of 24,000 ft. in the north and deep gorges. The mighty himalays protect Bhutan from the rest of the world and keep it untouched and sacred from the rest of the world. By the beauty, nature and area covered, this country is having similarity of Switzerland. The Drukpa Kagyupa School of Mahayana Buddhism provided the essence of rich culture and a fascinating history. This tiny Himalayan Buddhist Kingdom is having innumerous population of 6,00,000 with four main linguistic groups – the Sharchopas, the Bumthangpas, the ngalongpas and the Lhotshampas. Bhutan is largely influenced by Mahayana Buddhism which influences every aspect of life to the people of this country. “Druk – Yul”, meaning LAND OF DROKPA (Dragon People) is the traditional name of Bhutan since 1700 AD. This country has gone through several phases of history and witnessed internal strife, practiced Shamanism and lastly embraced Buddhism. The history of Bhutan dated back to 2000 BC, as there were evidents of civilization established by aboriginal Bhutanese, known as Monpa, believed to have migrated from neighbouring Tibet. The religious belief of ths Kingdom dated back to the 8th Century. In 749 AD, Guru Padmasambhaba was believed to have flown in Bhutan from Tibet on the back of tiger and arrived in Takstang ( near Paro). From Taksang he started propagating Tantrik form of Mahayana Buddhism. For centuries Bhutan witnessed number of feuding regions, until it was united under king Ugyen Wangchuk in 1908 who was unanimously accepted as king and a hereditary monarchy system started. Before that during the early 17th Century the fragmented feudal regions united for the time being under the Drukpa Kagyupa sect of Mahayana Buddhism by the religious figure and the military leader Shabdrung Ngawang Namgyal. During his period number of dzongs were built to guard the valleys and now-a-days these dzons serve as the religious and administrative centre each of the regions. Until 1960 Bhutan was isolated from the rest of the world and its people carried on a tranquil and traditional ways of life. In 1961 during the reign of the third king of Bhutan, Jigme Dorji Wangchuk constitutional reforms introduced for the first time in the history of Bhutan. And in 1974, during the tenure of the king Jigme Sinye Wangchuk, the veil of detachment from the rest of the world slowly started shifting and tourists started visiting this recluse country. Arguably Bhutan is the most exclusive tourist destination in the world as the country still keeps its own old charm of the old world and the travelers experience the full glory of this land. Around 70% of this country is still vovered with the lush green forest and embodied with the fortress, ancient temples, monasteries and the forested hills, rivers and gorges. Tourism in Bhutan is flourishing very rapidly. Bhutan is also called “ Valley of Medicinal Herbs”. This country is also enriched by its rich Flora and Fauna results from its unique geographical locations in the eastern Himalayas, where the Tibetan plateau meets South Asia. Bhutan is accessible by two ways. By Air and Road. There is no Train connectivity in Bhutan. Phuentsholling is the border town of Bhutan. and it’s the only way to enter in Bhutan by road. Another tiny border entry point is situated in Assam. Or if someone comes by Air, then he/she will land at Paro..the only airport of Bhutan. When do you visit Bhutan? 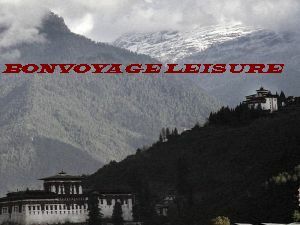 The ideal time to visit Bhutan is February to Mid June and September to November. But if someone is interested to enjoy the beauty of snow then he/she should visit during December & February. If coming on road then tourists have to stay one night in Phuentsholling. Indian Nationals need tourist permit for entering Bhutan. For entering Phuentsholling, no paper is required. From Phuentsholling permit is issued only for Thimpu & Paro. Permits for other places are issued from Thimpu only. All permits are free of cost. Foreign Nationals require Visa for entering Phuentsholling and beyond. Those are coming by Air will have to make their permit from Paro Airport. Only Druk Air ( Bhutan’s National Carrier) operates flight to Paro from Delhi & Kolkata. Foreigners flying in to Bhutan need prior Visa. 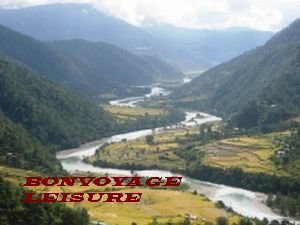 Bonvoyage Leisure has designed, promoted and arranged Bhutan tour packages, local sightseeing along with Bhutan holiday packages for tourists’ attractions under Bhutan tourism . 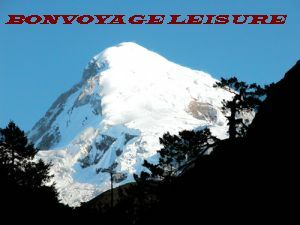 Bon Voyage Leisure assures its esteemed guests for providing them the best travel packages in Bhutan .